Home / Blog / All aboard the Tiger Express for fundraising awareness! I feel a wee bit guilty about posting this news. 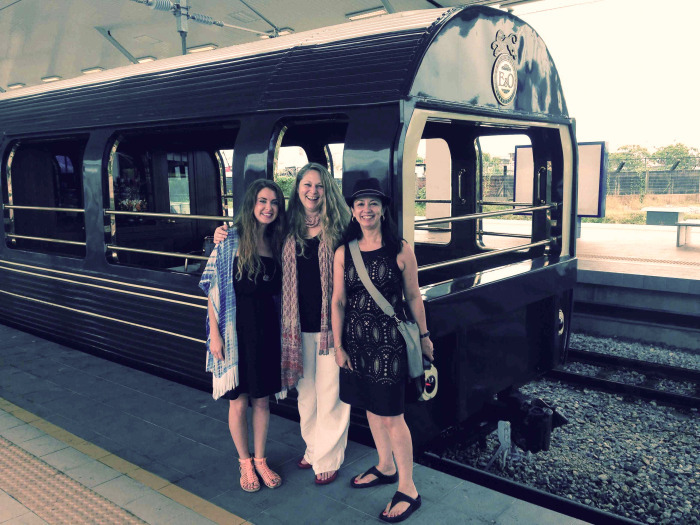 Earlier this month, I traded in the tackety boots for a little glitter – three days in the company of some highly inspiring and motivated tiger lovers on the luxury train journey of a lifetime. 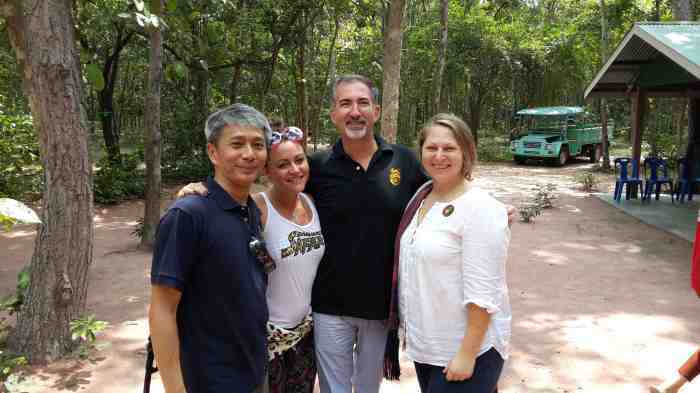 Courtesy of the fabulous folks at Belmond and YTL, who teamed up with Save Wild Tigers (SWT) to run a special Eastern and Oriental “Tiger Express”, we raised awareness and much-needed funds for SWT beneficiaries – EIA, the Born Free Foundation and WCS Malaysia. I was, naturally, delighted to accept the invitation to join fellow tiger conservationist Dr Melvin Gumal of WCS Malaysia on board the train to excite and inspire the passengers on all things tiger and what we are doing to try to save the species. The glitz, glamour and celebrity of the journey were a far cry from the steamy jungles and seedy wildlife markets where we normally find ourselves. Embarking from Singapore (after breakfast at Raffles! ), our first stop was at Kuala Lumpur and YTL’s Majestic Hotel for a royal gala dinner and auction. In attendance was Her Royal Highness the Sultanah of Pahang, Sultanah Hajjah Kalsom. Bringing British sparkle to events was fashion guru and TV presenter Gok Wan and actress/model Jaime Winstone. Malaysia’s singing starlets took to the stage and English National Ballet’s Maria Sascha Khan also treated guests to a performance of The Dying Swan. The tiger-inspired auction included luxury holidays, exclusive art and Lauren Baker’s Crystal Tigress head bedecked with 50,000 Swarovski crystals. The evening concluded with a bit of a boogie with Imagination’s Leee John. All aboard at midnight, the party was in full swing and everyone was having a ball. Hats off to Gok Wan, Jaime Winstone and Leee John who did a marvelous job of entertaining everyone and at the same time reminding them of why they were there. What a splendid bunch of people. In the afternoon of day two, as we travelled from Malaysia to Thailand, things got serious. Melvin and I presented to a full carriage of guests, twice, sharing our experiences in anti-poaching, habitat protection, investigating the trade and campaigning for an end to tiger farming. On day three, we had the opportunity to meet with a local community at Kanchanaburi which has fought to protect its patch of forest from land developers. A little oasis for villagers and the wildlife they share the forest with. Disembarking in Bangkok that night, we headed to the Mandarin Oriental for a farewell reception and one final auction item – a delicate tiger-themed fan by Jane Lee McCracken. Save Wild Tigers is doing the arithmetic and we should be able to announce soon what this year’s events from the Mango Tree, the Tiger Express and Majestic tiger ball have generated for our tiger campaign. It’s not just about the money, though. I hope our fellow passengers will not only carry memories of the journey but also messages about tiger conservation. We met some incredible people from diverse backgrounds, people who have worked hard and overcome challenges, people who empathised with the obstacles we face in trying to save the world’s most magnificent cat, busy people who took time out of their schedules to take part in an important cause. They move in circles where just talking about tigers can help change minds, policies and practices in favour of the tiger, or where the majestic beauty of the tiger can inspire fashion and art, making the tiger accessible to everyone. Special thanks to Save Wild Tigers, the management and staff of the E&O Express, Belmond, YTL, Raffles, Mandarin Oriental and everyone who climbed aboard the tiger express! Roaarrrrr!